Robin Walsh is the curator of the Lachlan Macquarie Room in the Macquarie University Library. For the past 20 years he has been actively investigating the life of Elizabeth macquarie to piece together her relationship with Governor Lachlan Macquarie, their life together in colonial Sydney and the history of their Jarvishfield estate on the Isle of Mull in Scotland. Robin Walsh has undertaken research trips to Scotland, England, India, Sri Lanka, South Africa and Russia, and curated exhibitions of If these walls could speak, Seringapatam 1799, Under a tropical sun and Imperial eyes, which all been compiled in a digital project Lachlan and Elizabeth Macquarie Archive (LEMA). As a historical consultant for Caledonia TV (Glasgow), Robin has appeared in “Lachlan Macquarie: the father of Australia’ a docudrama created for BBC Scotland the History Channel. As a librarian and a researcher, Robin Walsh edited and complied the book “In her own words: the writings of Elizabeth Macquarie”. Elizabeth left a special imprint on the people and places of NSW, especially in Parramatta through her advocacy of the arts, architecture, gardening and education. Elizabeth Farm now is a popular tourist destination. Robin is coming to Parramatta City Library for the lunch hour author talk on Wednesday, 23rd, November, from 1 pm. 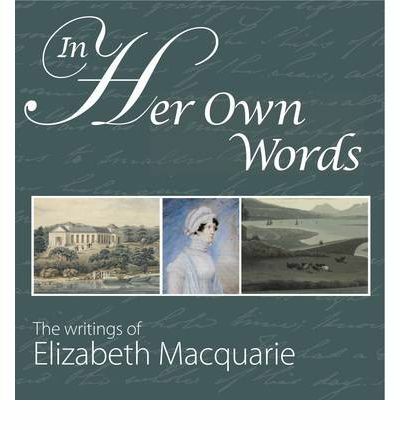 This entry was posted in All and tagged Author, Author Talk, book review, books, In her own words: the writings of Elizabeth Macquarie, Parramatta City Library, Robin Walsh, Writer by admin. Bookmark the permalink.